Is the internet penetration in these states not sizable? Karnataka, which had its elections in May 2018, has 17 million Facebook users. Each of the two major political parties assumes they will win (or lose), hence no point in spending on digital ads. However, they did spend on print and TV ads. Unfair. 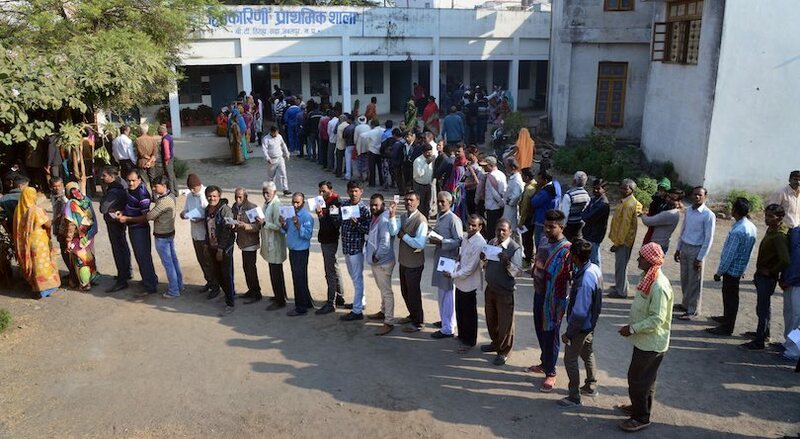 People wait with their identity cards to cast their votes for the Assembly elections, in Jabalpur, Madhya Pradesh, Wednesday, Nov 28, 2018. Have digital publishers figured out a way to reach the people we see in this photo? In just 2-3 years I believe internet penetration will reach many more in India. India expects to “add” another 500 million internet users soon. By 2021, India will have 536 million Indic users & 200 million English users. Ultimately one tends to spend on a platform/site if they consider it to be an influencer. A politician wants their ad to be seen on a particular digital platform (FB vs individual publishers vs Google, forget Twitter) if they feel the reader gets influenced. A digital publisher can attract that kind of user base only if they publish unbiased opinion articles, backed by data. It is best to focus on getting users / traffic for assembly election coverage with the assumption the ad revenues will come from sources other than the political field. I still think digital publishers in India have a great opportunity for covering General Elections 2019. But are the publishing houses ready to invest in good content? Irrespective of who wins in these 5 state assembly elections, I believe digital publishers lost.